← Memorial Day on the Intrepid. I had, of course, heard good things but you never know. And now with the grading system in place, I was worried a C would send us running (I never noticed a letter grade and I’m going to remain blissfully ignorant on this restaurant). We had to navigate down a few decidedly non-touristy and slightly creepy streets before we made it to Totonno’s and just in the nick of time too. As I walked in the hostess/waitress/busser immediately got our attention from the back of the restaurant (which to be fair was just about 15 feet from where we stood, maybe less) and said that she’d have a table momentarily and that the two open ones were reserved. Sure enough a couple finished paying their bill and in less than a minute we took their place at a booth that might seat 6. The walls were lined with their press clippings and other memorabilia that immediately lets you know you are eating at the right place. An older woman who seemed to also do every job in the place was photographed in a few of the magazine spreads. There were about 8 tables total and with my seat facing the windows I could see a crowd gathering outside. The ladies-of-all-trades frequently checked on the tables without hovering and also gave the line outside regular updates. They let us know they only had large left so we ordered a large w/peperoni. It turns out not only do they make their own Mozzarella but they also prep the dough in advance so that when they say they ran out of small they mean it. 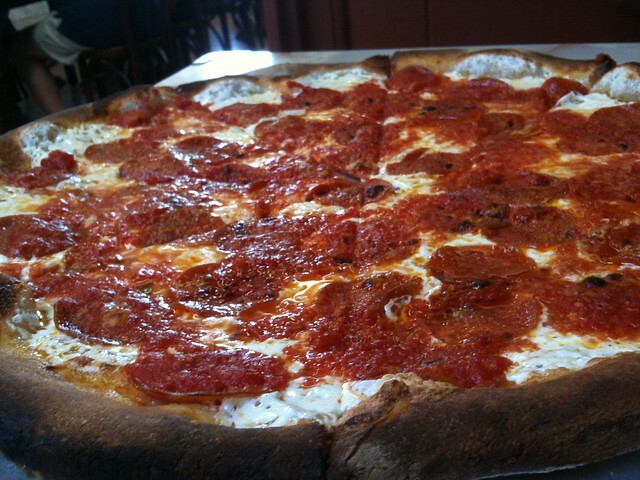 No matter, I could have kept eating; the pizza was so delicious. The edges were dusted with black, charred spots and the bottom was crisp but somehow still pliable and the toppings were still perfectly moist and flavorful. The pizza was still fold-able (for those of us that turn it into a taco. There was this perfect amount of cheese and peperoni that almost went to the edges – at a lot of places you inevitably feel as though they are skimping. Something must be wrong with me because I asked for Parmesan. Paul said that was an insult to the kitchen. I contend it’s not. But then again if he seasons his food that I make without tasting it I’m not happy. As we ate, I really enjoyed the vibe – it was unpretentious – I could hear someone being trained in the kitchen, a nephew perhaps learning his summer job. An older couple was seated after us at a similarly large booth, after they had given their order and sipped their drinks the younger but still probably in her 40s lady-of-all-trades came up to them and said she was going to move then to accommodate a larger group. They were regulars and didn’t mind. Paul noticed that when they finished their pizza they still had some crusts left so the same lady-of-all-trades sprinkled some olive oil on leftovers and the couple finished every bit. 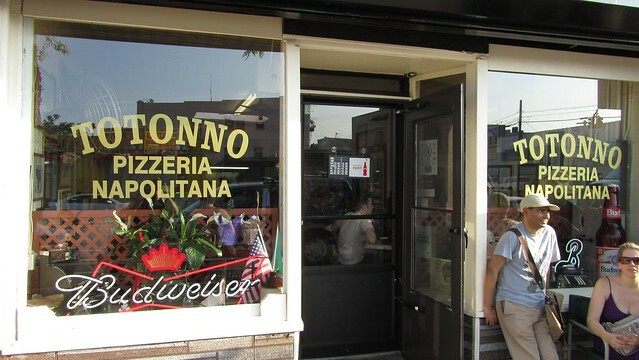 I want to be a regular at Totonno’s. This entry was posted in everything i've blogged, food, locations and tagged Brooklyn, dining out, Firsts, Pizza, weekend adventure. Bookmark the permalink.